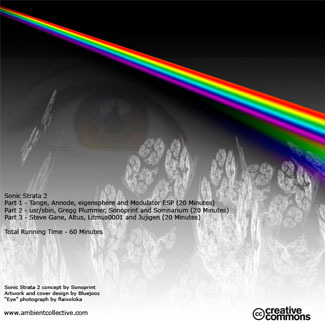 This album was recorded live on 26th January 2011, as episode 70 of Adventures In Sound. Equipment used: Korg Wavestation fed through a Frostwave Resonator filter, which then fed an FMR RNC compressor. The resulting signal was routed through an Electrix Repeater looper, and then through an Alesis Wedge effects unit. 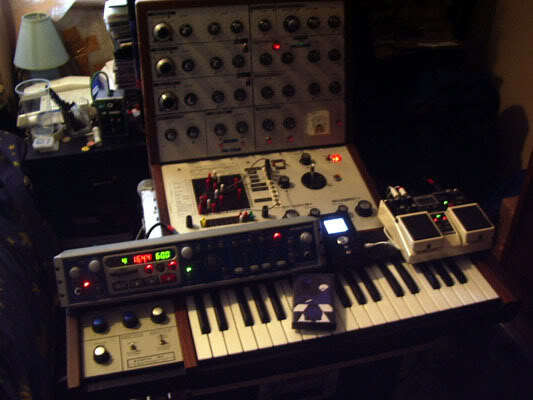 The filter was used to control the harmonics of the Wavestation sounds as they were played, and the looper feedback was set to around 70% so that as new layers were added old layers gradually died away. 08.12.10 2010 releases: over the course of 2010, the following nine albums were made available for sale, primarily at live events but also through the Modulator ESP forum. These have now been added to the merchandise page for mail order. These are all live performances that I felt were interesting enough to make more widely available. 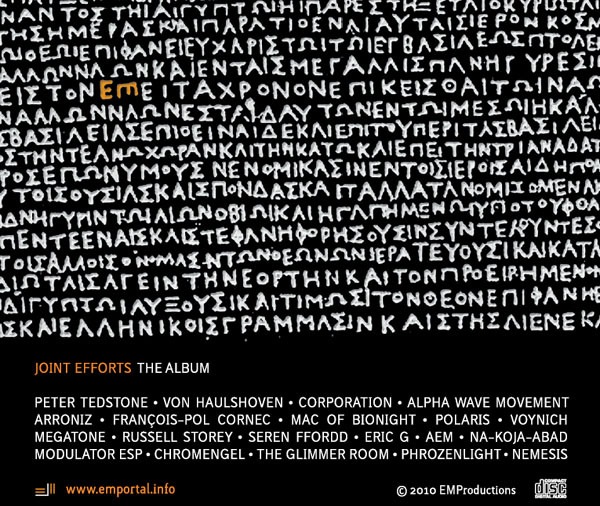 I am very proud to be part of this release as it is a great set of music and shows off the huge sonic potential of the EMS range of synthesizers. It was recorded in one take using Nord modular, Frostwave Resonator, Electrix Repeater and Boss DD-20 and is dedicated to my recently ex-girlfriend. There's some good stuff on this. 09.10.10 The Sloow Tapes cassette edition of New Horizon's is sold out at source, but I still have a few copies left, will add them to the shop in due course, but until then email me if you want one. Here is the performance from Rammel Club 26, it is quite noisy and experimental. The program I designed for the event is available to download: Rammel 26 programme. 27.09.10 Here's my set from electro-music 2010, mostly dark and ambient, but with a rhythmic finale, here's the Atmosphera collaborative set, with Shane Morris, Steve Weinstock and Richard Lainhart and here's the Adventures In Sound collaborative set from electro-music 2010, with Shane Morris, Steve Weinstock, Bill Fox and Bill Manganero. Here's a photo of the Atmosphera collab, featuring, from left to right: Richard Lainhart, Steve Weinstock, myself and Shane Morris. and here's the Adventures In Sound collab, featuring, from left to right: Steve Weinstock, Shane Morris, Bill Fox, Bill Manganero and myself. This is the setup I will be using for the Rammel Club gig tonight, EMS VCS3 Mk I, with DK2 keyboard, Electrix Repeater for looping and Boss DD-20 for delays. 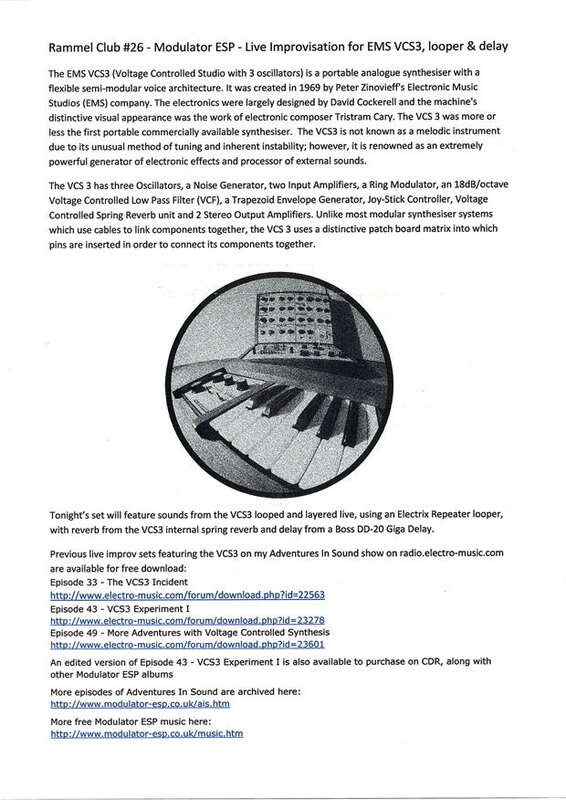 14.09.10 Modulator ESP will be performing a VCS3 only experimental set at Rammel Club on Saturday 25th September, supporting Muscletusk and Scrim. 25.07.10 The Music page has been updated with the recording of my performance from the electro-music.com Summer Solstice streaming event. 24.07.10 The Adventures In Sound page has been updated with 7 new episodes, numbers 31, 33, 35, 37, 39, 41 and 43. 22.07.10 My first official label release is out now, on the Belgian Sloow Tapes cassette label. It can be purchased now from the label, and from me in due course. Dark brooding synth exploring analogue space with Jez Creek (also active in Astrogator, Cerberus and Quadra) behind the knobs. Time dissolves in these hallucinatory fugues invoking the unnatural dimensions of Klaus Schulze’s seventies work across the emerald pond. 70 copies. 09.06.10 Due to a last minute cancellation, Modulator ESP will be performing at Rammel Club on Wednesday 9th June, supporting James Ferraro & Monopoly Child Star Searchers. 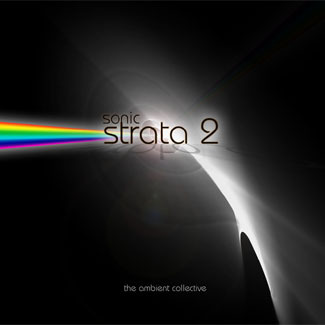 Sonic Strata 2: Three teams. Four artists to each team. 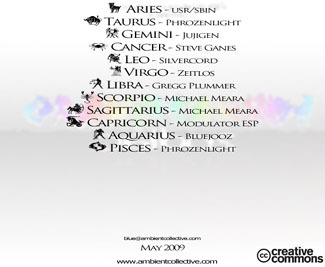 Each artist created a layer and then forwarded it to the next team member. What you are about to listen to are end products. Three stunning and beautiful ambient pieces of work. 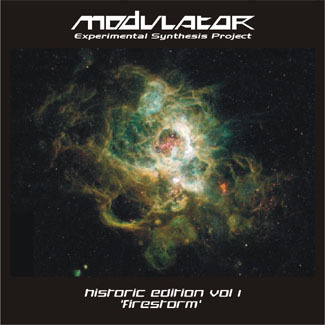 Part 1 created by Tange, Annode, eigensphere, Modulator ESP. Part 2 created by usr/sbin, Gregg Plummer, Sonoprint, Somnarium. Part 3 created by Steve The Keys, Altus, Litmus0001, Jujigen. 10.04.10 The latest two episodes of Adventures In Sound are now available from the Adventures In Sound page, one is a journey into the unknown, the other is a solo nord modular improvisation. 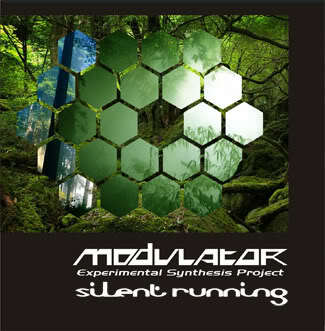 18.03.10 Modulator ESP will be performing at Rammel Club on Friday 28th May, supporting Stellar Om Source. More details will be added when they are available. 28.02.10 A new page has been added to catalog my episodes of Adventures In Sound, featuring details of performances and links to downloads. 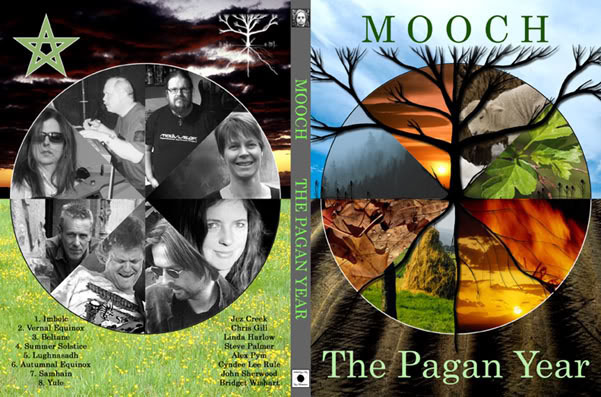 13.02.10 I feature on the new album by Mooch main-man Steve Palmer, a new space-prog epic, The Pagan Year. I perform two synth solos on the track Imbolc, one on Prophet 5, the other on Nord Modular G2. 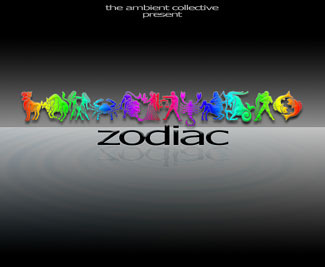 As before, the music is spacey, progressive, rock and electronic. Covering eight tracks over two disks, the album invites the listener to travel through a pagan year, starting with the ancient festival of Imbolc, passing through two equinoxes and the summer solstice, and the pagan festivals of Beltane, Lughnasadh and Samhain, then finishing at the midwinter solstice, Yule. Also featured: Bridget Wishart (Hawkwind), Alex Pym (Dream Machine), Chris Gill (Band Of Rain), Cyndee Lee Rule, Jez Creek, John Sherwood and Linda Harlow. Erich Z. Schlagzeug is the drummer. As we've written many times, one of the great pleasures of running a netlabel is to meet new artists and release their music. A related pleasure that is in many ways even cooler is to be able to release something for the first time by folks you already know and love. 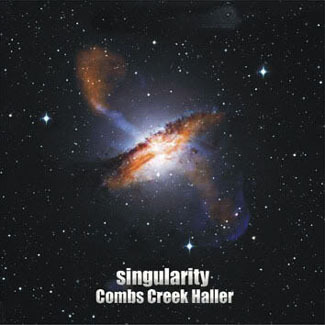 It is precisely that honor that we have today, with this majestic new release called Singularity. 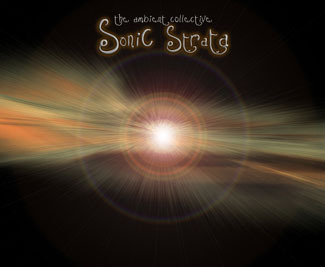 This magnificent two-disc album was recorded live the evening of November 6 and into the morning of November 7, 2009. It so happened that Jez Creek, who calls Nottingham in the United Kingdom home, was visiting in the Atlanta, Georgia area as part of his USA tour, in order to perform at the City Skies electronic music concert on November 7. Kevin Haller, whose house Jez was staying at, was also performing at the same concert. And Jim Combs, being the organizer and founder of the concert series, was of course going to be performing as well. So just for fun, the three decided to do a live concert on StillStream.com the night before the big show. And the results were so good that they decided to release the recordings as this album. Amazingly, given the quality of the pieces, the music was completely improvised. The musicians had never performed together as a group before this set and no preparations were done prior to the broadcast except for choosing keys and tempos. 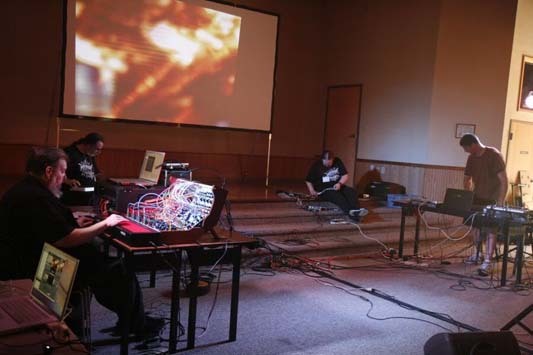 Somehow these three artists who had never played together at the same time, and had done almost nothing to prepare, immediately found a zone in which electronic ambient music of the highest order started pouring forth. Needless to say, the audience that night was blown away by the set, and we think that our listeners are going to be similarly impressed by what they hear in Singularity. For indeed, this is some of the most beautiful live ambient music we have heard in quite awhile. Earth Mantra has long been a fan of all three of the artists' solo work, but we were dumbfounded by the synergy the three artists found so effortlessly as they sat down to play. 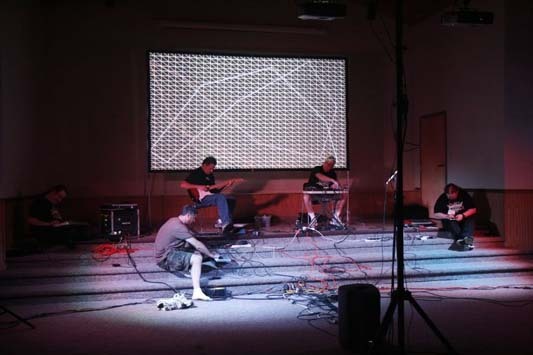 Improvising live ambient music can be a challenging task, and to do it really well, with the right balance of patience and activity, is surprisingly hard. The fact that these three artists could hit such a bullseye, with zero preparation and without the benefit of knowing each other's live playing styles, is in our eyes nothing short of miraculous. We could attempt to describe this music to you, but ultimately we would fail. Suffice it to say that it is beautiful, it is well constructed, very competently performed, and it just plain rocks. Better yet, why not download a copy of this album right now and give it a listen for yourself. We are certain that any fan of ambient music will be very happy they did. 01.01.10 Here's my set from the electro-music.com NYE streaming event, I started a bit early and went on a bit too long but I still don't quite understand how it ended up being 75 minutes. This includes the couple of minutes while the server re-booted. 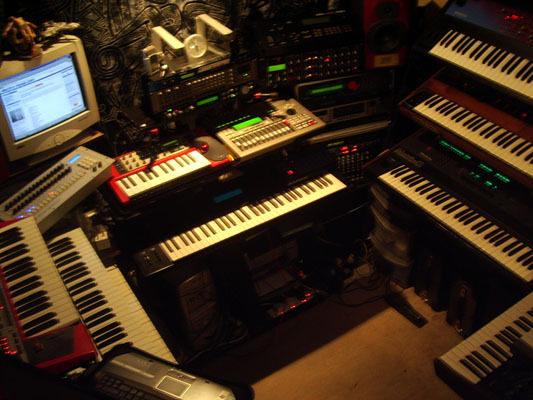 I used most of everything in the studio, from the small stuff like my Kaossillator and ipod touch to the big stuff like my Prophet 5 and Matrix 12. Sequences are pre-dominantly Zeit as I've been getting back up to speed on it. 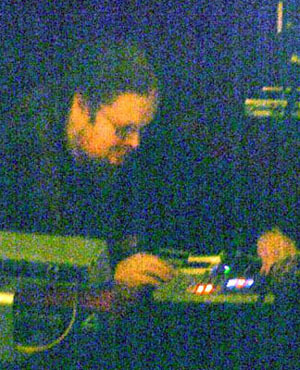 24.09.09 In my first show for 'Jez or Rob's Adventures in Sound', '...and now for something completely different' part one, I played a 30 minute modular improv, recorded as the rehearsal for my AE09 set, then performed a live 30 min ambient/sequencer improv. The Ambient at the Gallery gig went well, a 10 minute clip from my performance has been added to the video page. Thanks to Phil for uploading this. The set worked out really well and I'm hoping to give this a proper release at some point. 16.08.09 On Saturday 4th July I went down to London to meet a friend I knew through the electro-music.com forum, EdisonRex aka Paul Harriman, who does a radio show called Edison's Ephemera every Friday night on radio.electro-music.com. One evening, in the chat after his show we discussed meeting up to jam, and as it turned out the next available opportunity was a party he was having for July 4th. 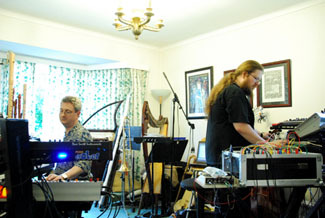 Here are a few photos showing us set up in Paul's music room, photos by Alexander Morris. 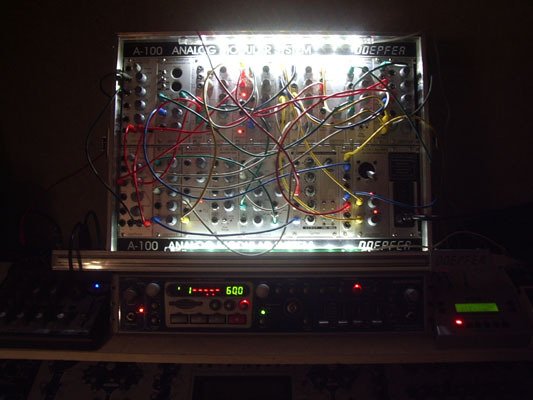 19.07.09 Another modular experiment has been added to the Modular Experiments page, this time using a ribbon controller to 'play' notes, whilst controlling the sound via the joystick. Includes real time looping/layering via the Repeater. 14.07.09 Youtube videos from the Relativity gig on 23.06.09, with Peter Tedstone and the Awakenings gig, with Phil Booth (Zeitlos) as Zeitlos ESP, added to the video page. Thanks to Phil for uploading these. 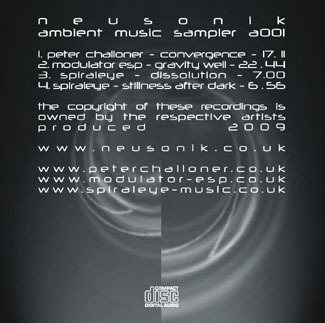 01.07.09 Neusonik promotes 'ambient at the gallery' live music event at The Hand & Heart Gallery, Derby Road, Nottingham on Sunday 27th July 2009, featuring Spiraleye, Modulator ESP and Peter Challoner, entry only £3, doors from 7pm, and releases new ambient music sampler, neusonik.001a featuring the acts who are performing, this is available to download free from the Neusonik samples page. 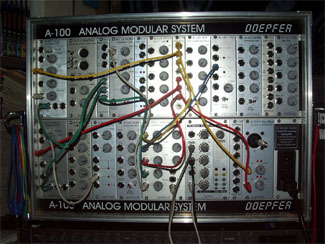 14.06.09 I've added a new Modular Experiments page to the site, for modular synth experiments, and have added a couple of bits recorded today using my A-100 modular, and a couple of older pieces recorded with my Nord modulars. These aren't really 'music' as such, but quite interesting to listen to if you like more abstract stuff. 07.06.09 In the process of re-organising the studio, I have decided to sell off some gear that isn't seeing enough use, to allow me to make better use of the limited room I have. See the Gear for Sale page for details. 26.05.09 Ghosts in the Machine III has unfortunately been cancelled. Instead I will be performing the set I had planned for GITM III on the radio.electro-music.com show Space Port Zero Nine on Saturday 13th June. I will be presenting the show as Shane is away. I'm also hoping to do a Nottingham gig in June sometime with Peter Challoner/SpiralEye, hopefully some more Stillstream streaming concerts and maybe even something abroad in October. There are also some interesting possibilities for a new studio album on the horizon. Here's my very minimal set-up for the event, Nord G2 into Electrix Repeater, two Evolvers, used for drones and some sequencing, SP-404 for effects and pre-recorded drones and effects, Boss RE-20 space echo and VF-1 for reverb and delay. 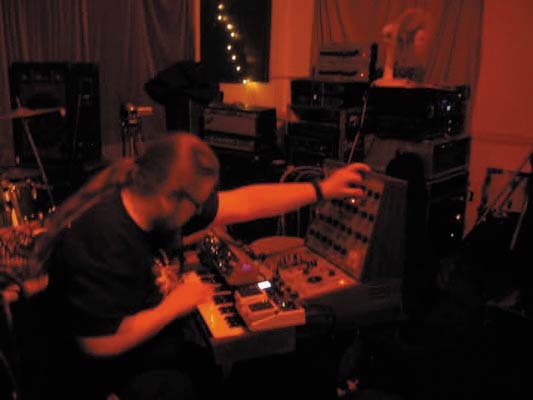 07.02.09 Modulator ESP performed a live set on the Stillstream show 'Mysterious Semblance' last night. (6th February) Preceding the set was an interview recorded on Monday 2nd February.The set got a very positive reaction and is available to download, as is a copy of the interview. I hope to do further sets every month or so. Thanks to everyone who listened to the set live and joined in the chat and thanks to Gordie aka Tange for organising it all, especially as it was the first live set on his show by another artist. 26.01.09 The Rammel Club gig went really well and I really enjoyed the whole thing. the place was full as loads of people had come to see Emeralds. Emeralds were on last and they were what everyone had been waiting for, myself included. They are three young chaps from Ohio, two with synths (Korg MS10 and Moog Microomoog) and one with a guitar, all three with lots of pedals. They played a set with huge walls of synth/guitar drone interspersed with sections of spacey melodic guitar and even a section of sequences. It was all very loud and noisy but still kind of cosmic and was over far too soon after only 30 minutes. 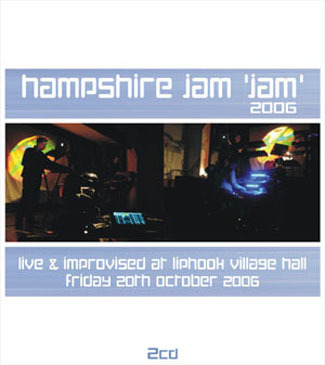 03.11.08 Jez will be appearing at the Hampshire Jam 'Jam' at the Millenium Hall in Liphook on Friday 14th November 2008 and as part of Astrogator at Awakenings on Saturday 22nd November 2008, at Paget High School in Branston, Burton on Trent, along with Hashtronaut and Create. 02.11.08 Dundee Live was great fun, though due to major problems there was a last minute venue change, so my set was amalgamated with the Vietgrove one to get us both on in the reduced time available at the new venue. I opened with a 20 minute solo slot and then did 40 minutes of complete improvisation with Norman and Mark of Vietgrove, which was great fun, if a little chaotic in places. StillStream DJ Gordon "Tange" MacMillan will be broadcasting his live recording of the recent DundeE-Live festival on his "Mysterious Semblance" program throughout the month of November, with the Modulator-ESP/Vietgrove set on Friday the 7th, will be; Altres on the 21st; and John Dyson on the 28th. 17.08.08 The Mantile gig went really well, I felt my performance on the night was much better than any of the practice run-throughs, everything just seemed to flow really well and sounded great. Got a great response from the crowd and the promoter and got some very nice feedback from people I spoke to after the gig. 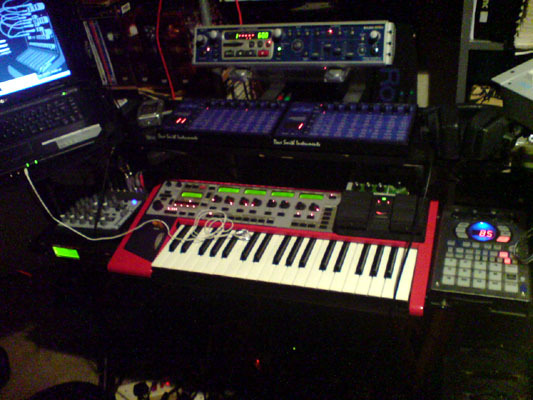 Equipment used: Alesis Andromeda A6, Prophet VS, Nord Modular G2, Sequentix P3, Boss DD-20 and Roland SP-404. 30.06.08 Video from the Awakenings gig on 28.06.08 is now available on the video page. 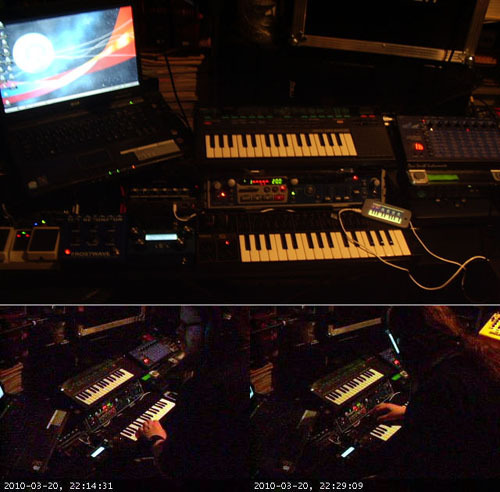 22.06.08 The images page has been updated to include photos from last week's Elektron gig, the Awakenings gig in February and the Nottingham Live and Immersion gigs from last year. There is also a small clip from the Elektron performance on the video page. Elektron Flux is an improvised album, featuring ambient sections, looping, sequences and more melodic structured sections. 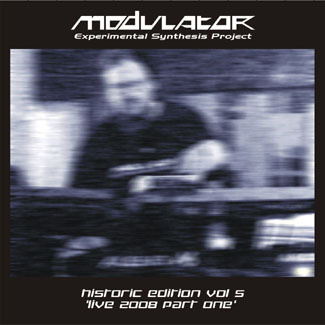 Recorded live in one take on Friday 13th June 2008, for release at the Elektron Festival the following day. 20.06.08 An Immersion images gallery page has been added here, featuring photos of all the acts that took part. 22.04.08 Modulator ESP has been asked to open 'DundeE-Live 2008' at Hustlers in Dundee on Saturday 18th October 2008 appearing with John Dyson, Ian Boddy, Ron Berry, Altres, Ion and Vietgrove. See gigs page for full details. 27.03.08 Demon Star Update: Well, I've lived with the latest version of this for quite some time now and have decided I'm as happy with it as I'm ever likely to be. If you can't wait just send me an email and I'll sort something out sooner. 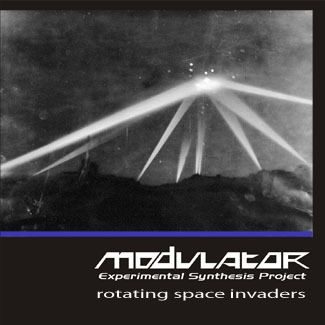 25.01.08 Modulator ESP will be appearing live at 'Elektron 08' at the Kingsley Theatre in Redditch on Saturday 14th June 2008 appearing with Peter Tedstone, Create and as part of Astrogator. See gigs page for full details. 25.01.08 Modulator ESP will be appearing live at the Awakenings at Paget High School, Burton on Trent on Saturday 23rd February 2008 supporting Vietgrove. See gigs page for full details. 01.01.08 Unfortunately, the slot was lost due to technical difficulties. To make up for it I've just recorded a 40 minute improv, with all the gear and sounds I had set-up for last night, which is available for download for those who may wish to listen. It's mostly spacey ambient, but the sequencers and trons are fired up about halfway through. 30.07.07 Modulator ESP now has a Virb site, where you can stream loads of my music, including some stuff not available elsewhere. Suddenly got the urge to do another ambient drone project on Friday night. Did all the basic recording mixing and processing in about 3 hours. It's another 74 minute epic drone in the vein of Zeta Reticuli. It still needs some re-mixing and the odd tweak then it should be ready for release. Here's a preliminary cover design. Recording review 10 June 2007, "Zeta Reticuli v1" v1, the subject of this review was created first, but begs review second, after v2. Both pieces are the same 74 mins long. The distinction is that v1 does not have the added instrumentation of v2 and the ambient bits are in the mix foreground. They are in character, two entirely separate works. v1 produces an anaesthetic heavy limb, out of body feeling that distinguishes it as "dronology" whilst v2 leans more towards early classic Berlin school synthesis. There are some wise words in the Wikipaedia entry for artist Mark Rothko "It forces one to approach the limits of experience in the post-Kantian sense of the categories of space and time and awakens one to the awareness of one’s own existence." I would stick that label on the front of Zeta Reticuli v1. 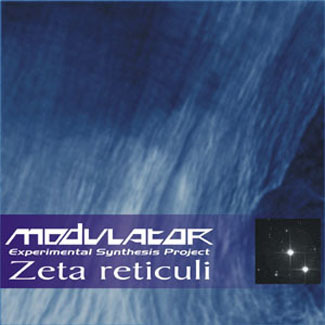 Recording review 04 June 2007, "Zeta Reticuli" a 74 min, 106MB modem buster of a download available from the main Modulator ESP website - in two versions. The version I am reviewing is the second more developed version. ZR comes in two mixes - the original, and v2 with added instrumentation. Like v early Tangerine Dream - Zeit era, only more minimal - truly space music. The first 8 minutes, a slow intergalactic soundscape, builds to the entry of a big metalic a-tonal slab of noise, rotating and evolving by minute 17 fading then rejoining in the mid left of the stereo field, almost forming into a melody - but never quite. By the time you reach minute 19, the theme has crept over to the right before subsiding back into a distant re-statement of the opening black night storm. The sonic density up to minute 26, remaining mid right, middle distance while some very subtle, almost inaudible (I was listening to this quite loud on high-end headphone; Sennheiser HD580 that pick up everything) interweaving non-music tantalises at the edge of perception. At min 30, the background wash drops suddenly to a bleak insistent single note that focuses in intensity and volume, rising, centre stage in the soundfield, pulling in another sonic blizzard in it's wake, evolving into a fragmented melody theme, in the manner of Klaus Schulze's Body Love/Mirage/Dune. Minute 36 sees some lower register entering from the left and the main theme dissolving once more into a rising windstorm, that by minute 40, crescendos into intense clusters of tone. The melodic theme re-joins at minute 44, pleasingly distant, and at 46:31 a nice counterpoint emerges briefly holding onto a very long single note that sustains and modulates at min 54 into a new high, melodic line. The piece starts it's descent at around minute 60. Briefly (in the context of the pace of the piece!) a shimmering shoal of tones swims around the stereo field, and a new melody is stated before fade to black. 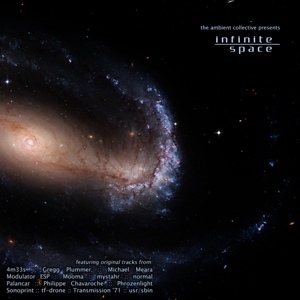 A deeply enjoyable work of great restraint and subtlety, and an absolute must for all space music followers. 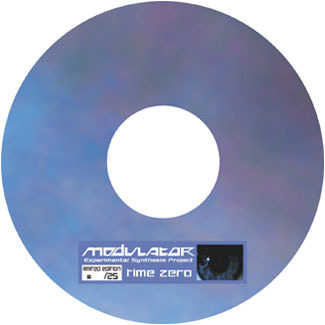 The fourth Modulator ESP album Time Zero, initially released as a limited edition of 25 copies, which is now long sold out, has been re-released and is now available as a FREE download from the Internet Archive. 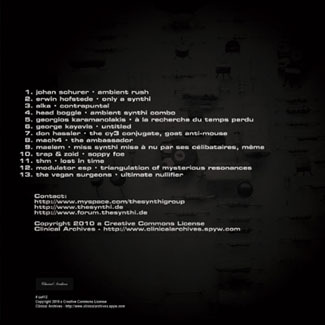 Time Zero is a set of live studio improvisations recorded between 2003 and 2006. 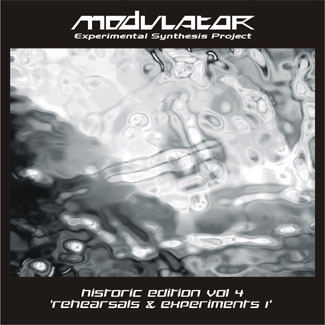 Most tracks feature improvised Berlin School style sequencing. All were recorded in one take, with occasional minor edits and/or overdubs to complete them. Further details are available from the Time Zero recordings page. 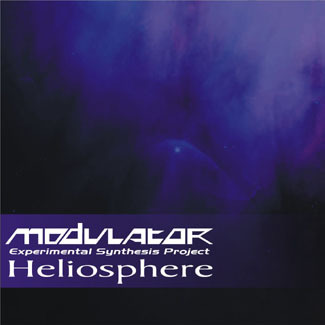 The sixth Modulator ESP album Heliosphere is now available. Heliosphere is available to stream and download free from the Internet Archive. Right from the beginning of this album one gets to notice that this work is something completely different for Jez Creek aka Modulator ESP. Deep drones rise out of nowhere, transforming into a gigantic, monumental, gargantuan wall of sound. The album is named after a binary star system where both stars are somewhat similar to our Sun. The system is known thanks to a legend (for want of a better term) that says that there was once a humanoid race living on one of the planets that orbited one of the suns, but the planet was later destroyed by its own dwellers. Therefore, these creatures started looking for a new home. The legend also says that some of them reached the Earth, but the information concerning the aliens was conspired by governments. There's a group of people who claim to be the descendants of this alien race or maybe even aliens themselves which of course can hardly be trusted. Anyway, the music is suitably spooky, out-there and cosmic in a mysterious and menacing kind of way. Not any sort of Berlin School by a long shot, stylistically it comes as close to Dark Ambient drone music as it probably can. Sometimes the drone is augmented by high-pitched sonic elements but overall the sound is deep, hollow and intense with several layers of drones making up for a very thick miasma of sound. All the changes on this album are subtle but they are quite discernible if you listen closely. Did Jez create his best work so far? It could be. In any case, if you enjoy Dark Ambient music and especially Dark Space or long-form Drone Ambient - you will find lots to enjoy here. This is a work that needs to be heard. Well done! Well I've taken the plunge Jez, and listened to Zeta Reticuli 2 from start to finish. In fact although it is fairly dark, it isn't that dark is it !? The addition of the more melodic sounds, definitely facilitated my enjoyment of this album, as I'm sure the original would have simply been too much for me. This version though did work for me, and I was really quite impressed with it. You've created some really nice effects and sounds, that really keep this piece entertaining, so that not once did I feel bored or twitchy. I particularly enjoyed the cosmic wind effects, that swirl around and gather pace, a little like a roller coaster ride for the mind... cool !! Yeah, this was an interesting and different musical excursion for me, and although I won't be playing it everyday, I will be returning to it at some point for another ride on those cosmic winds. :) Nice one Jez, and thanks again for the opportunity to listen to it. Roy Jackson. 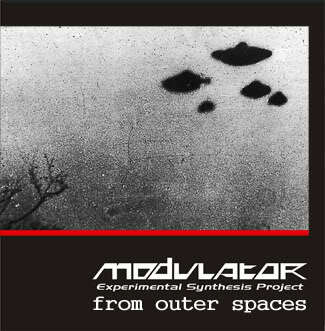 The fifth Modulator ESP album Zeta Reticuli is now available for FREE download from the Internet Archive. Zeta Reticuli 2 is one 74 minute deep space drone, based on a piece produced at the end of last year, with added elements to provide a more melodic contrast to the harsh oppressive monotony of the original piece. The original piece, Zeta Reticuli 1, is also available from the Internet Archive. 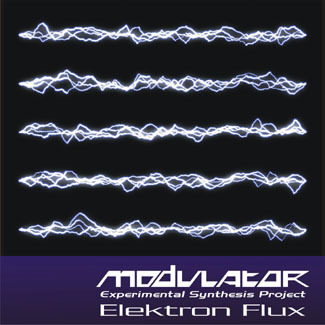 Modulator ESP, Emkah, DJ?, Formication: Sat 13 Jan 2007, Orange Tree, Nottingham, England. It's a while since I last saw Jez aka Modulator ESP play. His sound has matured beyond recognition. He is in control of the machines – and there are a lot of them. Jez has scoured the planet in the quest for his racks of vintage instruments. This performance gave us a dense wall of interweaving Phaedra era Berlin School. Lots of flutey, choral mellotron and huge chunky analogue 8 step sequences. Jez – this is no criticism, just my preference – I would have liked a build into a classic Blade runner end-titles sequencer blow-out to produce that tingly scalp perfection. Emkah was not my reason for attending the gig. But a very accomplished set. Just not my cup of tea – a bit too drum machiney for me. Followed, by a DJ that destroyed the mood and demolished the build up that the two preceeding acts worked so hard to achieve. Why did the DJ leave a ghastly sample loop playing for about 15 minutes after he left the stage??? This left Formication with a lot of work to do. Coupled with a PA and room acoustic that could not cope with the sonic complexity of Formication's latest beat driven dark sample synthesis, the performance did not reach out and captivate - the potential to do so was clearly there. I had to leave half way through the set so this review is very much qualified by a number of downer factors. I would like to hear this performance again at high volume in an acoustically balanced auditorium and then I would love it. Finally, a plea to Modulator ESP and Formication – try and find an esoteric venue that does your respective genius credit – you've both moved beyond playing in pubs full of a reluctant captive audience. How about this for an idea – look for sponsors that stump up investment capital and save up for a bigger splash venue/PA – you are both ready for the next step up. I would chuck an unconditional 20 quid in the hat to get things started. Well, I think that all went rather well. I got a good response to my set, which was quite dar, with plenty of nasty drones and some pounding sequences, with some nice ambient interludes as well. 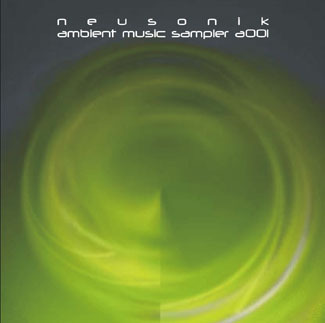 I also gave out a fair few of the neusonik samplers and got talking to quite a few people, so hopefully I've made a few contacts who might be able to help out with promotion.. I might even be doing some collaborations with both Emkah and Alec of Formication as they both wanted me to make them some stuff to mangle. But I sauppose that's one of the perils of playing a pub on a Saturday night, lots of people who really didn't know WTF we were playing. Having said that a few people I spoke to said it was great because it was so different that it was refreshing. 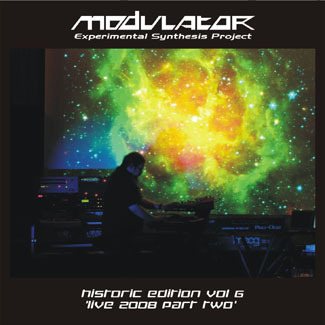 Modulator ESP appears on two new albums: the debut 2CD Quadra album 'First Contact' and the 2CD record of the Hampshire Jam 'Jam' 2006. Both albums are available direct from AmbientLive using the links on the merchandise page. 01.01.07 To help celebrate the New Year I've uploaded a couple of bits of music, the first is a recording of my gig at the Rose of England on the 25th July last year, the second is an experiment with deep space drones called Zeta Reticuli, both are available to stream from the music page. Also finally got round to giving the gear page a long overdue update. And finally my first gig of 2007 will be with Formication at the Orange Tree on the 13th January, see gigs page for details. 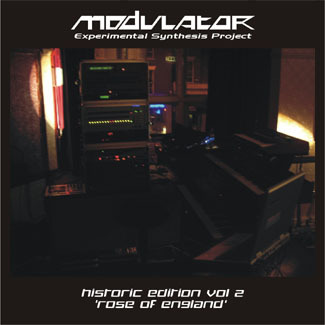 "Tronic Pulse" starts with warbling & rasping synthesizers coupled with mysterious Mellotron flute. After a while a sequence builds and we are immediately in mid-70's Tangerine Dream territory. Not bad! "Beyond the Sun" has excellent deep intro. Jez made an excellent job of synthesizing really out-there sounds on this one. This is cosmic EM of the highest order. I just have to wonder why they don't use this stuff in movies about cosmos these days, going for some boring orchestral drek instead. Excellent sequence starts and what a great sequence it is! Coupled with a super-punchy bass sound it really has a bite to it! The Mellotron flute appears in this track as well, combining to great effect with synthetic textures. This is Berlin School with a fresh attitude - top notch stuff! 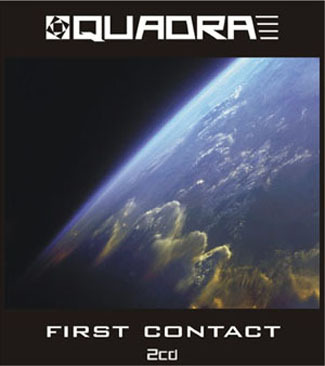 "Quadratic", once again has quite an aggressive intro, with harsh, raspy sounds and echoing clangs. After a while a slow sawy bass sequence appears. Another sequence joins the flow, making this a real wall-of-sound experience. This is stark, dark and decidedly un-commercial Electronic Music. The sequences are excellent while the overall nature of the track remains absolutely otherworldly. I think if you're into geometry - you will enjoy this. Jez has really managed to express the beauty of simple geometrical forms with this one - sort of a dry, naked beauty wrapped in intricate forms. And where one would be without that Mellotron flute? There's a bit of that too, but it only appears for the last several seconds of the track. Next is "Eos Flight" that initially sets the stage with deep and mysterious effects & pads. A rhythmic pulse starts but never dominates. Looks like it's the most laid-back track so far. Various lead sounds and additional sequences play on top but overall the track retains that relaxed, jamming feel. The title track starts with echoes of unknown origin but after a while we hear some whooshing sounds and very deep bass throbs. Various other sounds can be heard and this is easily one of those effective intro's you don't want to end. However, as we are closing the 10 minute mark, a slow bass / rhythm combination starts and takes us to the next section that is dominated by ever-so-slightly shifting and morphing rhythms, all of them of the laid-back variety. This is an unusual track indeed and it's unlike anything I've heard from Jez so far. A great lead line is heard around the 16 minute mark. Another sequence appears as the lead line continues its play. Some heavier rhythms can be heard after 20 minutes into the track that has turned into quite a journey by now. Superb analogue-sounding solos add a pleasant warmness and really make me go "wow!" 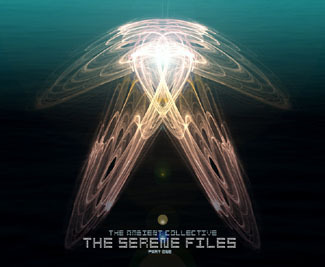 This is quite simply some of the best neo-prog EM I've heard in a while. Fans of Berlin School will be delighted, especially those who favour complex, long-form compositions with great rhythms, lots of sequences, atmospheres and a sparkling solo or two to boost. One thing to add is that Jez' sound is now much more refined (compared to previous efforts) and supplied with a good dose of reverb, adding the pleasant "spaciness" to his compositions. He seems to have put much more effort in his songs which are now better thought-out and composed with a level of precision and feeling that many would be jealous of. The last part of the title track lets the sequences to shine in all their glory and adds a new bell-like sequence that sounds very organic. A mournful pad sound is all one needs to complete the mental picture of traveling through space & time. The journey's over and we want more. But wait, Jez serves us a little dessert in the form of "Chromium". It consists of typical "Modulator ESP" atmospheres - all in a mysterious and a bit claustrophobic setting. Interesting little track. 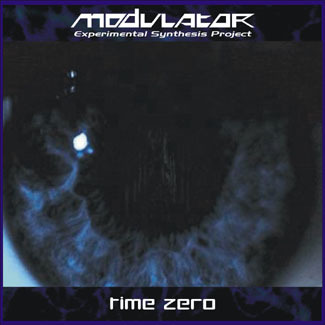 "Time Zero" is the best Modulator ESP album so far and a real must for fans of Berlin School / sequencer music. Excellent! Modular Xperiment 01 is an experiment using multiple layers of shifting sequences, ebbing, flowing and morphing. 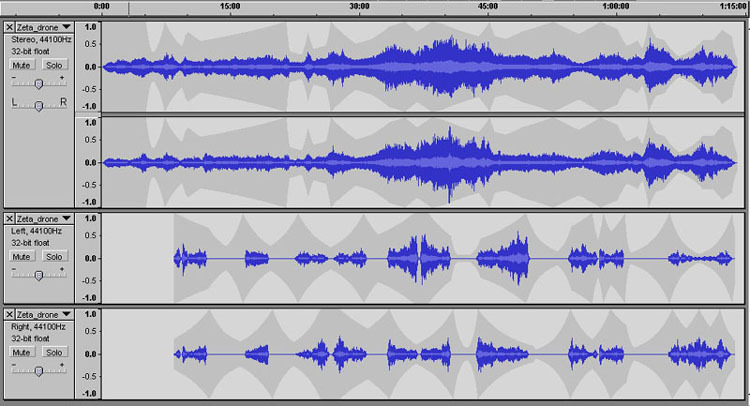 One slot was used for sequences and another was used for background noise effects. This one turned out to be quite 'Berlin School' like. melodic touches to the mix from time to time, well it just blows the top of my head off. The word genius comes to mind, he's that good in my opinion.. I really do highly recommend this album to all lovers of ambient, berlin school type music. Don't expect sequencers cranked up to level 11.There are sequencers here but they are used as part of the overall texture of the music, and rarely dominate, and this is right up my street. Superb!!! If you fancy getting a copy of this album you'd better hurry as he's initially released it as a 25 copy limited edition,of which i'm lucky enough to have no 3. Don't say you weren't warned. Well, a very nice album indeed. Listened to it yesterday and shall certainly be listening again. Anybody who has seen a Jez set will recognise the character of these studio solo pieces. Really well recorded, too. The lengthy title track is the superb centrepiece of the set, but the standout track for me is the gorgeous "Eos Flight", with its sequence, faux-percussion and a wonderful solo over the top. Beautifully judged. Nice one Jez, this is great stuff. "Eos Flight" should be appearing on "The Best EM 2006" if there was such a thing! Been listening to this since I got home. Eos Flight - The most orchestral track on the album. Another great sequence lurks in the background with some cool spacey sounds. Chromium - Rounds the album off as perfectly as Sequent C completes Phaedra. I have 3 other Jez albums but I think thia is going to be the most played one. Considering the tracks were recorded over a 3 year period, they all fit together perfectly as though they were all recorded at the same sessions. Up there with The Lambda Variant as my favourite EM release so far this year. Well, I played it once and immediately hit the "Play" button again once it had finished - a good sign. All in all, a really enjoyable album from start to finish. Highlights so far for me are "Eos Flight" and also "Beyond The Sun" especially the patient way the sequencers are introduced into the track. "Time Zero" title track is aptly named as I just float off and lose all track of time in the process, it is a meandering epic with vast distances and moods being covered over the course of its thirty six and a half minutes. Rather like the works of Ken Martin, this is an album that demands your total immersion to fully appreciate the nuances and depth. Mr Creek firmly has his finger on the celestial pulse with "Time Zero". 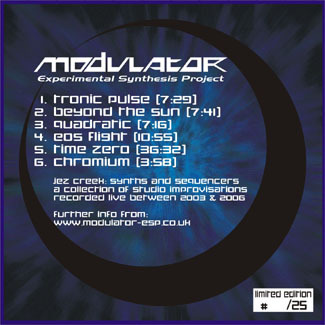 01.05.06 Time Zero the fourth album from Modulator ESP, is now available to order from the Merchandise page. 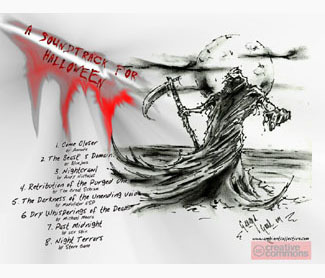 It is a limited edition of 25 copies, hand-numbered and signed. Further details are availble from the Time Zero page. 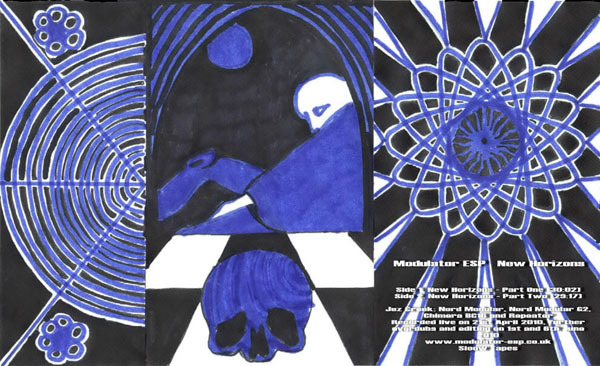 The next Modulator ESP album is due for release at the next gig in Shrewsbury on 2nd May 2006. 06.03.06 Had a move round in the studio over the weekend - new studio pictures added to the Images page. 24.01.06 Modulator ESP now has ArtistServer and Myspace.com accounts. Please check out my pages and my friends. 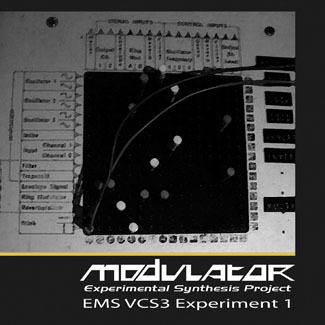 There is also a new Modulator ESP Forum for the discussion of my music and Electronic music in general. 22.01.06 Photos from my secret rehearsal gig at Bunkers Hill on Friday 13th January are now available from the Images page. 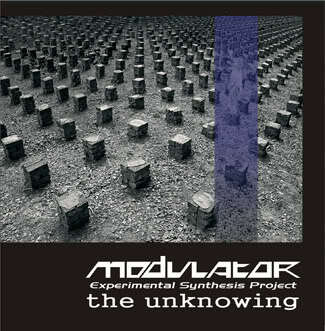 01.01.06 Modulator ESP performed a one hour improvised set at midnight on New Year's Eve that was streamed live on radio.electro-music.com as part of the electro-music.com New Years Eve Event. 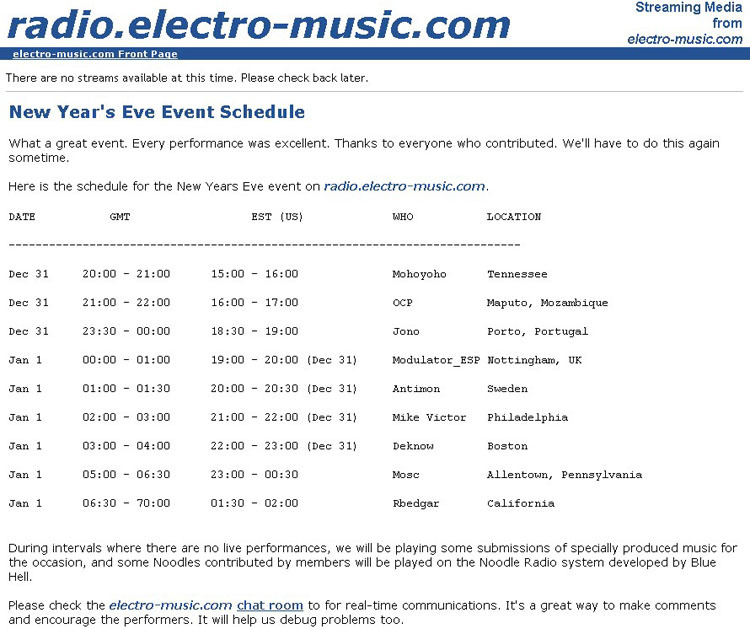 See screen grab below showing the schedule for this historic event, possibly the worlds first live international streaming concert. Will hopefully post mp3s as soon as I have time to transfer the recording to my PC. Hopefully the other performers sets will also be made available as there was some great music. 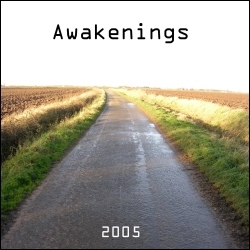 17.11.05 Modulator ESP has submitted an exclusive track entitled 'Gynomatik' for the Awakenings 2006 Vol 1 set due for release in 2006. 18.08.05 Paypal links to enable purchasing of all my merchandise have been added to the Merchandise page. 06.08.05 Modulator ESP is appearing at Bunkers Hill Inn, Hockley, Nottingham on Sunday 4th September supporting Dave Davies. Admission is FREE and doors are at 8:30pm. 06.06.05 Photo gallery from the gig with David Davies at the Rose of England on 04.06.05 has now been added to the Images page. My account of the gig is on my blog. 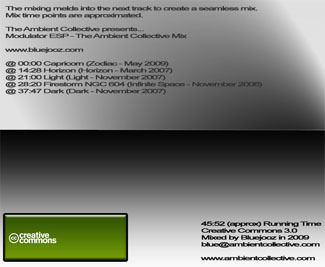 30.05.05 The Modulator ESP track Transpatial (from the Awakenings 2005 CD) was played on the US radio show EMUSIC on 26th May 2005. 29.05.05 Modulator ESP is appearing at the Rose of England, Mansfield Road, Nottingham on Saturday 4th June supporting Dave Davies. Admission is FREE and doors are at 8:30pm. 14.05.05 New photo gallery of updated studio pictures added to the Images page. Gear page updated and re-organised. 12.05.05 Photo gallery from the Awakenings gig at the Brudenell in Leeds on 22.04.05 supporting Ron Boots has now been added to the Images page. More photos are available from the Awakenings site and my account of the gig is on my blog. 22.04.05 Modulator ESP index page Hit Counter has passed the 2,000 hits mark , which is quite spooky really as today is the day of my 'biggest' gig ever so here's hoping it all goes to plan. 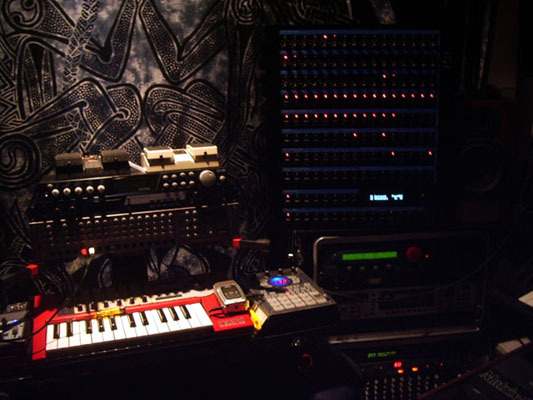 13.03.05 The Music and Gear pages have been updated, with Dark Star Voyage finally uploaded to this site (in 4 parts) and lots of gear added to the Gear page. 27.02.05 I've recently uploaded full MP3s for all of part two of Random Fluctuations to the site (see Music) and re-vamped several pages, including the recordings pages and the Spiritland page. 24.02.05 Gus and Helen featured another of my pieces, Dark Horizon, on the first programme of their new Electronic Music show 'Static Interference' on AiiRadio.net. The show is to air monthly on the last Thursday of the month between 2-4pm EST/7-9pm GMT and is well worth a listen. 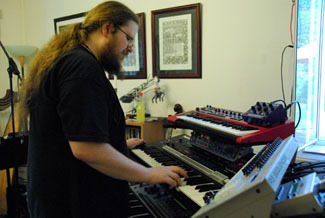 03.02.05 The AiiRadio All Electronic/Synth show with Gus featured two of my pieces, Wardance and Chromium, here's hoping there's another one soon as it was an excellent show with a diverse range of music. Thanks to Gus and Helen for plugging the Awakenings gigs. Some of my music is going to be featured on AIIRadio between 2-4pm EST/7-9pm GMT on Thursday 3rd Feb 2005. Click on the banner below - Realplayer 10 required. Drop me a line if you catch the show. Site Stats: in 2004 the best month was August with 716 visits, however in 2005 there have already been 793 visits in January alone so it looks like things are looking up. 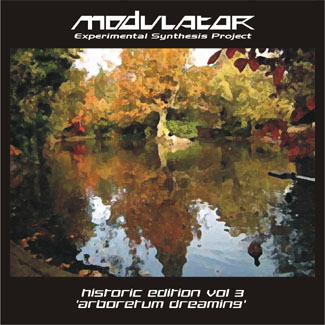 Modulator ESP has two tracks featured on the new Awakenings 2005 3 CDR set. CD1 features the exclusive track 'Transpatial' recorded live during the practice sessions for my November Awakenings gig last year and CD3 features 'Dark Star Voyage', recorded at my first ever live performance. The full track-listing and details of how to order are available from the Awakenings website. Thanks to John Sherwood for organising this. 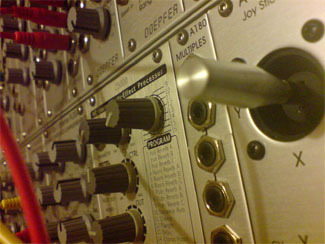 www.modulator-esp.co.uk has now been online for one year. I have just upgraded my hosting account and now have much more web space so will be adding lots of stuff over the coming months, including some older music and some more experimental stuff. 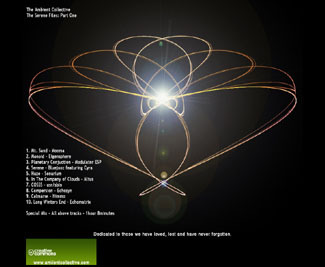 Astrogator, my joint EM project with Steve H (Create) now has it's own site at www.astrogator.co.uk. 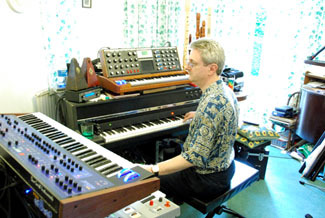 'Random Fluctuations' is a two-part electronic suite composed and recorded by Jez Creek in 2001. Each part is divided into several sections that all have their own subtitles, so in the end it's kind of a musical story. By listening to Jez' music, I'd venture that he has Prog rock background - there is a sense of thematic development and multiple part transitions typical of classic Progressive Rock works and also some classic EM albums like Tangerine Dream's 'Tangram' or 'Logos'. 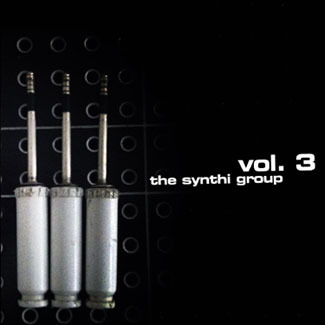 So, if you like early 80's Tangerine Dream or the music of Mark Shreeve, then this CD is for you. It's also quite symphonic sounding, with great dynamics and rhythms. Dark sounds get the first part underway. Soon subtle bass textures are introduced as the soundscape becomes even more intense. This is brooding music - very good stuff. After the 6 minute mark the rhythms are deployed full-time as well as some solos and sequences. I found my head nodding as I listened to this. Great themes and melodies! All is quite and mysterious again after 9 minutes into the track. Of course this section is a transition to the next part that has some warm flowing pads and is surprisingly gentle. Very, very good! Slow rhythm keeps things tight, while the melodies do soar in the sonic ether in a soothing and comforting way. There's even a hint of solemnity in there. The rhythm becomes faster and there are some symphonic textures that strongly remind of 'Tangram'-era TD. This is uplifting EM at it's best. And, oh, those solos...! It reminds me on EM from the days gone by. The track ends rather abruptly. The second part starts with dramatic string/ drum section. Pretty suspenseful stuff. Some e-drums are introduced along with a melodic sequence and we have a rhythmic section that's halfway between sad and mysterious. The dramatic strings and drums return after a while, sounding like an orchestral movie soundtrack. This time the string sounds are combined with the electronic rhythm and piano playing. Some great synth soloing is also welcome. There's a short intermission after which we get upbeat sequencer lines and a fast theme depicting the war I guess (according to the subtitle). Some very 80's electronic drums (Simmons-like) are used to great effect here. A piano theme comes next, with the sounds of wind in the background. The rhythmic elements do not take long to appear and take control of the proceedings. It's a mysterious and somewhat reflective part. Some processed voices are heard as the screaming solo takes over after 17 minutes into the track. Everything fits perfectly - from voices, to rhythms, to sequences, solos and atmospheres. It all calms down and all we hear for a while are phased / processed synth pads along with some recurring effects. But after a while another excellent melodic motif appears. I loved this part - very complex, even reminding a bit on some of Klaus Schulze material from the 80's. The final section starts with bleeping synths and upbeat rhythm. This is a bit techno influenced (mainly in the rhythms department). I loved the urgent electric piano motif although the main theme is a bit too "techno" for my taste. 'Random Fluctuations' is a darn fine album of melodic thematic Electronic Music, that those into most of vintage EM will enjoy, be it early 80's Tangerine Dream, the less sequenced Mark Shreeve, some 70's Vangelis or even Dave Greenslade's 'Pentateuch of the Cosmogony'. 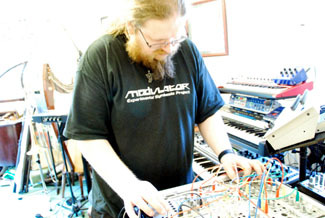 Modulator ESP is Jez Creek who makes sequencey, largely improvised music. Both albums from 2004 are live minidisc recordings from concert performances. 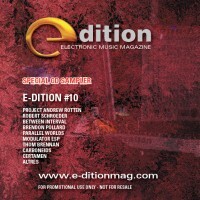 All tracks are improvised using pre-prepared sequences, vaguely in the Berlin School mould. The sound quality is nice but I'd prefer more reverb - the sound is a bit dry to my ears. Reality Excursion Sequences starts with 'Dark Star Voyage', which is a lengthy suite with multiple parts. The structure is a bit loose, so you kinda know this is a live recording when you listen to it. Some nice textures, but as I've said earlier I prefer a more spacey, reverbed sound. Nice sequencing and solos, though. 'Silent Planet' is a nice mysterious track (that also includes rather cheerful sequences towards the end) with repeating bass motif and good sequences / rhythm combination. 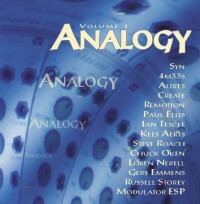 'Chaos Theory' is a chaotic (pun intended) and busy sequencer track (which initially makes use of sequence similar to that on the previous number). The second live album starts with 'Time Clouds' that has an atmospheric introduction with pads and soundscapes, but after a while melodic motifs and, subsequently, rhythmic sequences are introduced that drive the rest of the track along in a relaxed, unhurried mode. You will encounter some pretty tasty solos along the way. The second track is called 'Astral Dreams'. There's an abstract beginning with noises, soundscapes and stuff, but the sequences ought to appear sooner or later, and voila! - they do as we are nearing the 3 minute mark. 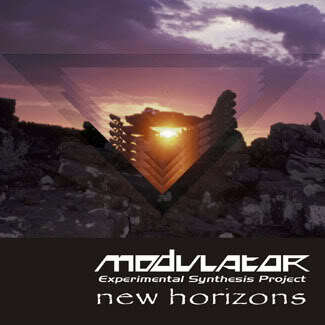 Low threatening chords are heard as we are propelled forward at a pace faster than usual with Modulator's recordings. I think it's the best of his live tracks (despite some use of preset choir sounds)- the sequencing is very competent here - pure New Berlin School, a bit trancey and yet more like prog EM. The title of the last track is 'Dark Star Voyage' - the same as the first track on Reality Excursion Sequences, but it's a totally different version. It starts with a reflective piano part that gives way to rhythmic notes and in the end it's another mid-paced sequencer track, in typical Modulator ESP style. They're not bad reviews are they, my sequencing is 'very competent' and there are some 'pretty tasty solos', though it looks like I'm going to have to buy a reverb processor and sort out some new choir sounds. It was a different sequence for Chaos Theory, but probably quite similar rhythmically. 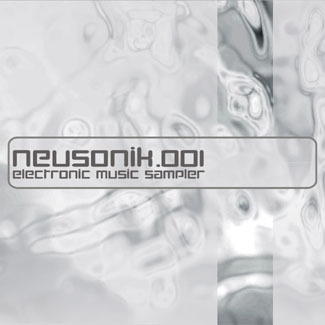 19.11.04 New track now available to stream or download from Soundclick. Entitled The Eclipse this is an improvisation recorded direct to hard disk on 2.11.04 during the preparations for my gig on the 7.11.04. 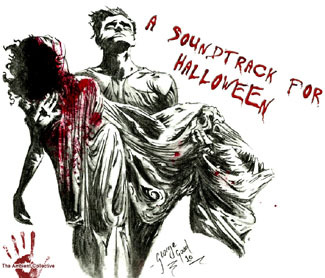 11.11.04 New track added to the Music page. Entitled Sturm und Drang II this is the second piece played at my gig at Peggers on Sunday 3rd October 2004. Photos from the 7th November gig have now been added to the Images page and the Awakenings website. 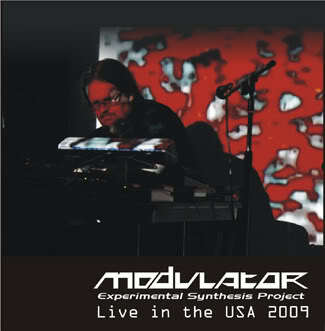 04.11.04 Modulator ESP Studio Pictures and new wallpaper have been added to the Images page. Home page, Recordings pages and Gigs page have been re-designed. Gear page has been updated and extended. 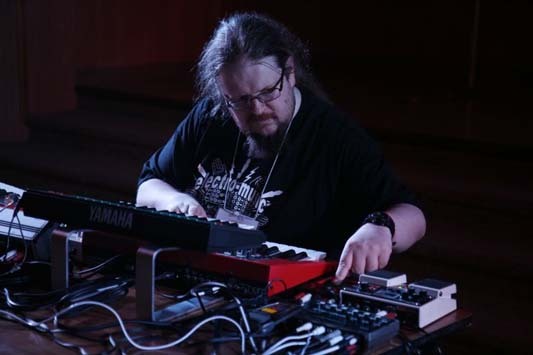 24.07.04 Modulator ESP is now a member of two webrings, the Electronic Music webring and the Space Music and Floating Ambient webring, links are on the home page. 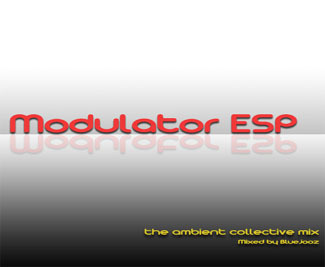 I have also just set up a weblog for regular updates on Modulator ESP at Blogger, link via top of this page and home page to http://modulator_esp.blogspot.com/ This will feature all the latest news and info on Modulator ESP as part of my online journal. Please feel free to add any comments. 27.06.04 Band links have been updated with many extra links and split into two categories, 'rock' and 'electronic' to aid navigation. Contact me if you would like a link to your site adding, with graphics if possible. 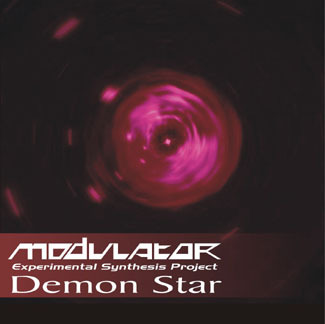 15.05.04 The track 'Dark Star Voyage' is now available for FREE streaming and downloading from www.soundclick.com/modulator (click on music to go directly to download page). Because it is quite long it has been chopped into 4 parts. 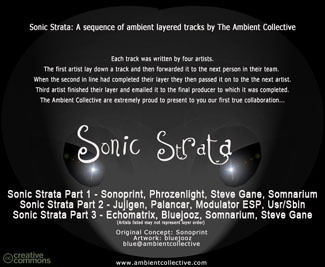 Part One recently reached number 34 in the Soundclick Ambient chart. 07.04.04 New page added for 'Time Clouds Distant Memory' and Merchandise page updated. New Photo gallery added to the Images page from last gig at Peggers. Thanks to Peter Challoner for taking the photos. Full report below. At present there are no more gigs planned for a while, as I intend to take a break from performance to re-record some of the music generated from the gigs in the studio in order to consilidate and hopefully improve on them. A fairly average turnout to a free gig. Thanks to those who came, particularly Pete Challoner for technical (roadie) assistance and photos and first-timers Dan, Jenny and Joe. Dave Davies once more opened the proceedings, stepping into the breach at the eleventh hour after the Did didn't, with a set of songs on acoustic guitar and vocals comprising mainly of his own material. For me this gig went a lot better than the last, perhaps because I was feeling less nervous and perhaps because I had lots more new material prepared for this one. Also for once there were no technical problems, which had caused some trouble at previous gigs. As Dave was only playing guitar I had room in the car to bring more lights and even my smoke machine, which all added to the atmosphere. New Photo gallery added to the Images page from last gig at Bunker's Hill. Thanks to Nereta for the photos of me 'in action'. Needless to say I took the lovely gear shots :-)) New pages added for Merchandise and 'Reality Excursion Sequences'. Website menu system has been re-organised to take account of new pages. A much better turn out than last time, in fact for most of the evening the only people in the pub were upstairs watching us perform. Dave Davies was support this time round and his performance started with a well received ambient instrumental on keyboard, electribe synthesizer and drum machine then performed a set of songs on acoustic guitar and vocals mainly comprising of his own material. Musically I re-used a lot of the main sequences/ themes from the last gig, but also incorporated some new ones and as usual nothing came out exactly as planned. After a false start I managed to set the minidisc to record. I found this gig harder and less enjoyable, perhaps due to actually having an audience this time. The set included extended versions of 'dark star voyage' and 'silent planet' with a completely different version of 'chaos theory' as an encore, parts of which may be used in a future release. 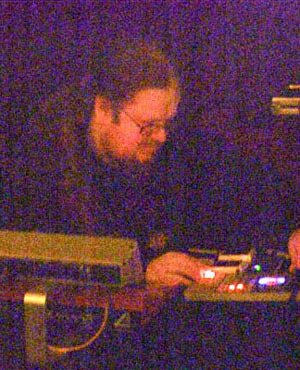 26.02.04 Next Modulator ESP gig booked for 28/03/04 @ Pegger's - see Gigs for details and brief review of last Bunker's Hill gig. New Photo gallery added to the Images page from recent gig at Bunker's Hill. Thanks to Pete Challoner for the photos. The live recording of the gig turned out pretty well, and initial reaction from those who have heard it is very positive. Well, the gig was a success on all counts except one: organisationally everything went very smoothly, with only minor hiccups; musically I played for over an hour and managed to remember to hit 'record' on the minidisc (so hopefully this will be available soon, after a few minor edits); but unfortunately there was a very low turnout. It seems no-one wants to go out and support live music, well not on a Sunday in Nottingham anyway. Dave Davies performed a well received set on acoustic guitar and vocals mainly comprising of his own material then performed an ambient instrumental on keyboard and drum machine. 26.01.04 Next Modulator ESP gig booked for 29/02/04 @ Bunkers Hill - see Gigs for details and brief review of last Bunker's Hill gig. 14.01.04 Contact Email Address, Guestbook and Hit Counter added to the site. 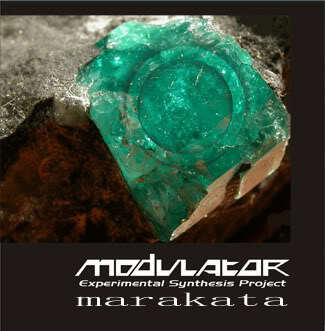 11.01.04 After much preparation www.modulator-esp.co.uk is now online and will be updated regularly. 02.01.04 Shadowdancer music is now available for streaming and downloading from http:www.soundclick.com/shadowdancer (click on music to go directly to download page). 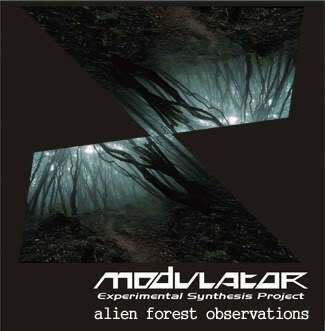 31.12.03 First ever Modulator gig booked for 25/01/04 @ Bunkers Hill - see Gigs for details. 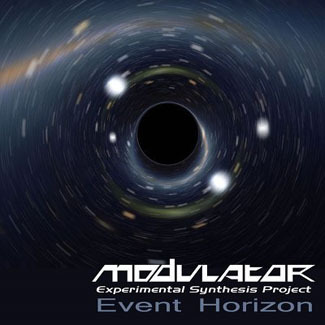 29.12.03 Modulator music is now available for streaming and downloading from http://www.soundclick.com/modulator (click on music to go directly to download page).